When the time comes every year that we eventually, inevitably find ourselves saying goodbye to warmer temperatures, it's hard not to start thinking about the warmest places we can find indoors. Kitchens are warm all year 'round when there's cooking going on, and bedrooms are always great as long as you can remain under the covers. But there's no place in the house that gets us as ready to settle in for long periods as a living room with a nice big fireplace. So since we were thinking about it already, we thought we'd share some of the fireplaces we'd most like to curl up by for the winter. This bright space with its high ceilings and subtle color palette immediately reminds us of all the reasons why we love fireplaces. 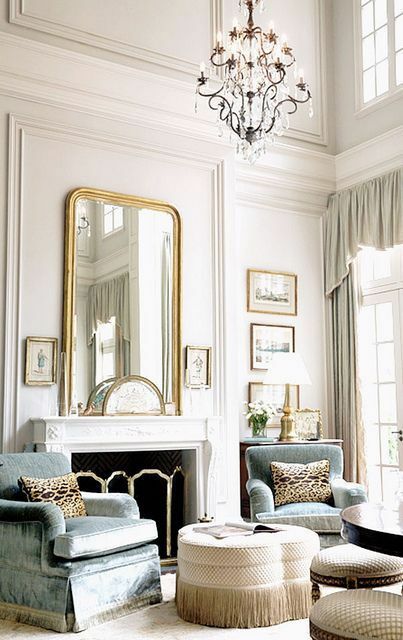 The classic shape of the mantel is a perfect complement to the architectural bones that define the rest of the room, all beautifully accentuated by the oversized mirror. Meanwhile, an abundance of colorful, comfy-looking seating makes the space by the fireplace all the more inviting. There's no better place to wait out the cold. This room offers a more modern take on the traditional fireplace. The space features art and seating in warm colors to accentuate the cozy feel. The plant near the seating and the images of wide open plains sitting on the mantel help add an element of the outdoors. When it's too cold to be outside, bring the outdoors in. This room is an ideal blend of the modern and the natural. The clean lines that define the fireplace, mantel and chair give the space a very contemporary feel. At the same time, the room is almost entirely filled by natural influences. Wood headlines in this space, linking the fireplace, seating and coffee table. A fireplace gate shaped to look like a congregation of branches continues the natural theme as do the actual branches that accent the space directly next to the fireplace. On the mantel, accessory pieces with a hand-made, earthenware appearance complete the look. On the other end of the spectrum, this stainless steel fireplace offers an ultra-modern take on the traditional hearth. The color fits seamlessly into the cool, neutral color scheme of the room while the metallic sheen offers a visual focal point for the space. Lacking a traditional mantel or any extra decoration, the fireplace, which occupies its own wall creates a monolithic presence in the room, accenting the importance of heat at this time of year. It's always fun to go big with color, and this space pulls no punches when it comes to declaring its love for bright hues. Though the fireplace remains white, it is framed at the top by the varying shades of blue that cover the walls. At the bottom, it is accentuated by the thick, multicolored rug. Seating in soft pink flanks the fireplace on both sides, offering an ideal spot for anyone wanting to enjoy a little extra warmth. Inspired by another natural element, this chic, minimalist, space uses the colors and textures of stone to create a simple yet appealing fireplace area. As a complement to the wooden floors, the stone appearance of the seating and the fireplace facade help to bring about a very nature-inspired feel. Yet the aesthetic is very different from rooms that focus mostly on wood. Sometimes the heat from the fireplace just isn't enough. The room has to look warm too. This room is full of warm influences to accentuate the heat from the fireplace, from the wood to the warm metallic accents. The unique overhead light fixture has a gaslight feel that complements the fire while its geometric shape keeps things looking contemporary. Like a few of the fireplaces we've looked at, this one lacks a traditional mantel for art and decorative pieces. However, this piece makes up for it by having its own decorative element built in. These beautiful chocolate brown tiles not only give this fireplace a unique look, the geometric pattern pairs nicely with other prints on the walls in the background. Simple; rustic; elegant. This ultra-modern fireplace keeps things natural with wood paneling and a minimalist color palette. An uncomplicated yet sophisticated space in which to unwind after a long day. If winter is your favorite season, fireplaces like this might just be why.